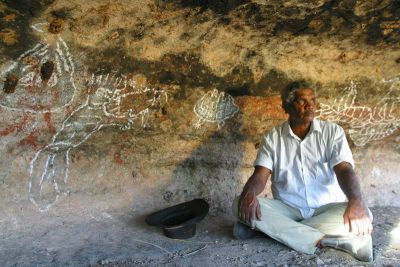 See hidden rock art and hear the stories. 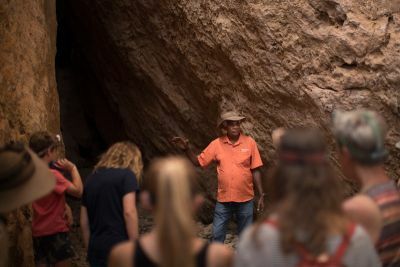 Join your Bunuba guide on a journey deep beneath the limestone of the Napier Range and discover the secrets of Tunnel Creek and its spiritual significance to the Bunuba people. Tunnel Creek is a water worn tunnel beneath the limestone of the Napier Range or follow respected Bunuba elder, Dillon Andrews on a culturally insightful journey that takes you through the heart of Windjana Gorge, revealing a side of this spiritual place few get to experience. Join your Bunuba guide on a 2 hour walking tour through Tunnel Creek, a water worn tunnel beneath the limestone of the Napier Range, part of the 350 million year old Devonian Reef system. Be inspired by this landscape of immense environmental and cultural heritage. Explore the creek system, learn about it's natural history and relive the life of Jandamarra, a moving and tragic story of a man between two cultures. All walking tours departing Tunnel Creek Carpark at the time arranged with group at time of booking. Groups only. Bookings are essential with a minimum 3 days in advance. Join with traditional owners, the Bunuba people on a culturally insightful journey that takes you through the heart of Windjana Gorge, revealing a side of this spiritual place few get to experience. Then journey deep beneath the limestone of the Napier Range and discover the secrets of Tunnel Creek and its spiritual significance to the Bunuba people. Details coming soon! NEW! Exclusive Rock Art tour in the areas surrounding Windjana Gorge! Guided by respected elder Jimmy Dillon Andrews this is a once in a lifetime experience. This rock art is only accessible with an elder like Jimmy Andrews – don’t miss your chance. Sites like Jumburrurru (Carpenter’s Gap) has shown Bunuba people have been on this land for at least 46,000 years. 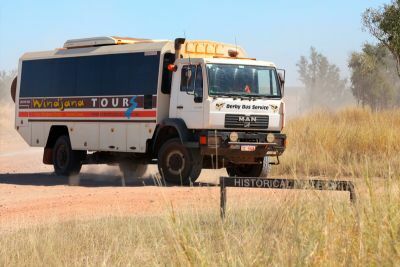 This tour is operated as a tagalong departing and returning within the same day to Windjana Gorge campground. Details coming soon! Bookings are essential a minimum of 3 days in advance. If you wish to cancel your tour you must immediately inform your booking agent. Once we have received your notice, cancellation will take effect. If you do not inform the booking agent and are a no show you will receive no refund of your tour price. If Cancellation takes place on the day of the tour your tour price will be forfeited completely. Cancellations more than 72 hours prior to tour will enable a 100 percent refund of your tour price. Bungoolee Tours reserves the right to cancel or postpone any tour at any time prior to departure if, due to weather conditions, road conditions, natural disasters, cultural considerations or other external events it is not viable for us to operate the planned itinerary. If we cancel a tour you may choose between us applying the amounts paid toward an alternative trip or receiving a full refund. We are not responsible for any incidental expenses that you may have incurred as a result of your booking such as visas, vaccinations or non-refundable flights. or stay in Derby (www.derbytourism.com.au).